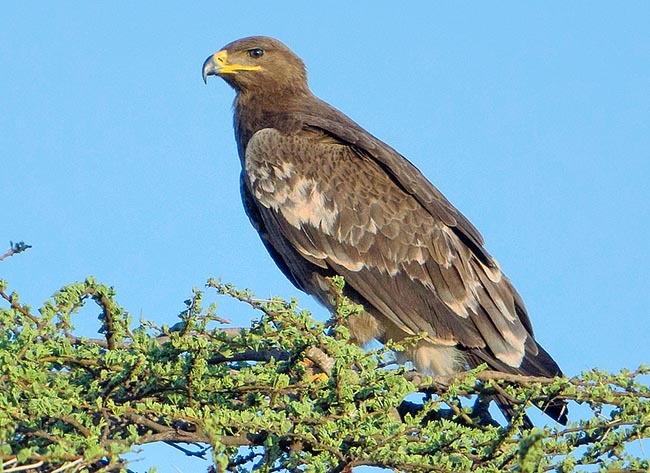 The Tawny eagle (Aquila rapax Temminck, 1828) belongs to the vast order of the Accipitriformes that groups almost all the so called birds of prey and to the family of the Accipitridae. The tawny eagly is a regular meeting in the African savannahs. Like the African fish eagle (Haliaeetus vocifer) is common in the humid and lake part, so is the tawny for the savannah and the steppe areas. In its genus is surely the most diffused and most present bird on the African continent even if, as we shall see later on, it has a second isolated and steady range in the Indian subcontinent. Typical for the colour of the livery paler among the brown eagles and for its persistence on the same territory all over the year, this eagle is well known by the local population with which it lives without any mutual disturbance problem. Furthemore, being a strong flyer, it spends a lot of time flying continuously over its territory and therefore is easily evidencing its presence. When not flying, it remains then perched undisturbed on some high dry branch or some electricity stake, motionless at the passage of animals or of persons, that often do not even deign it of a look. Itself too, from up there, absolutely not preoccupied by the presence of other beings, observes carefully who is passing under, following them with the movements of the eyes and of the head but without the least intention of abandoning its comfortable position. Although it has a fancy name, this eagle does not stand among the largest of its genus. Its dimensions are considerable but are not surely equal or at the height of other eagles sharing the same territory. The etymology of the scientific name has a fairly simple origin seen that since the old times these birds have always been known and considered as the vertex among the flying beings and have by force entered the history, the traditions and the language of every population. We can affirm that the history of these raptors had kept pace with the human history. The genus Aquila appears to be coming from the tawn colour of its livery, rightly, “aquilus”, of dark colour, whilst rapax simply from its “rapacious” behaviour. The latter attribute appears often in the European vulgar names. 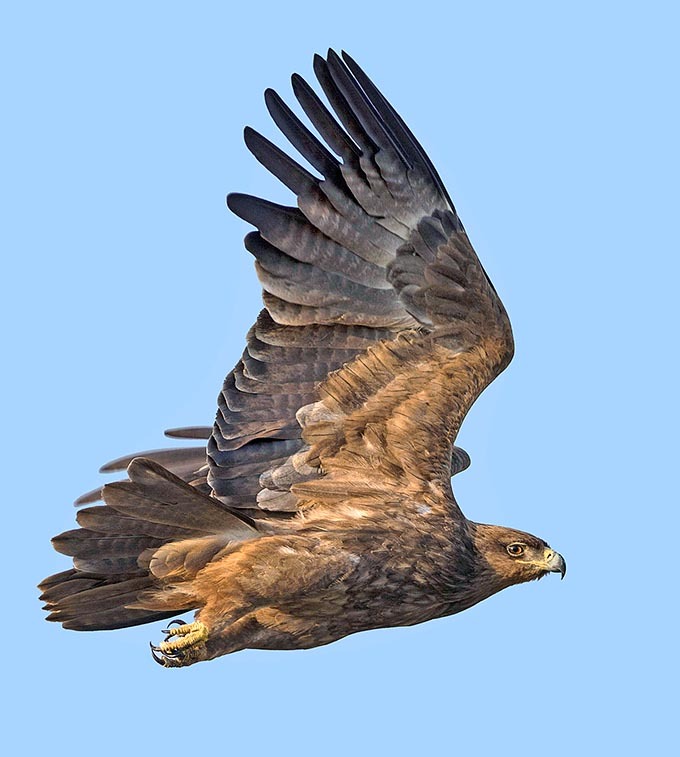 In French Aigle ravisseur or indien; in German Savannenadler; in English Tawny or Asian tawny eagle; in Spanish Águila Rapaz and in Portuguese Águia-rapace. 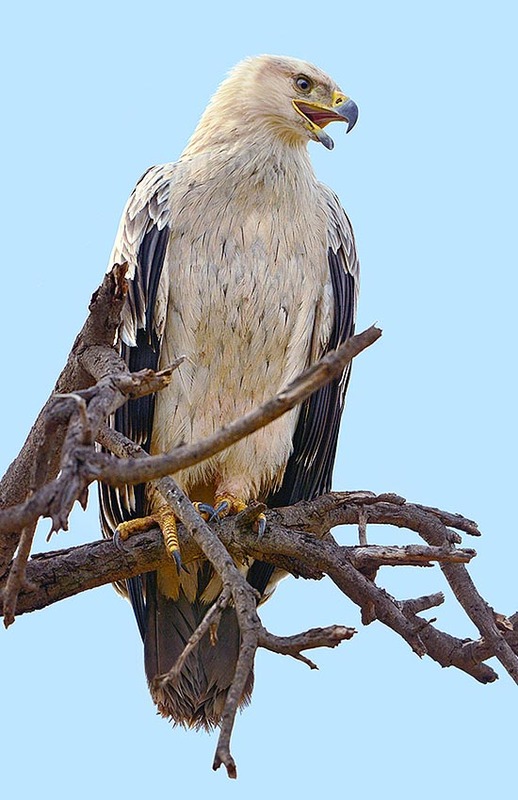 This eagle lives in all sub-Saharan Africa from Sahel up to South Africa and in the north-eastern part of the continent where is present separated from the original lineage, one subspecies in Morocco, Mauritania, Senegal and Gambia. In Asia, it lives in the Indian subcontinent from Pakistan up to Myanmar and with an isolated colony in the Arabian Peninsula. It is widely diffused and common in its range even if never in great number. Three subspecies have been determined linked in fact by their localization.The Aquila rapax rapax typically Centra African, the Aquila rapax belisarius of the north-eastern part of the continent, and the Aquila rapax vindhiana typically Asian. It is a sedentary bird in its origin areas even if have been reported short displacements during the monsoon seasons but always inside its range. This raptor does not love the forest or the highly wooded areas and not even the swampy areas but absolutely prefers open, steppe and pre-desert areas, with little vegetation and wide view for hunting. It loves the pastures frequented by large herds of wild animals as well as of domestic ones and for this reason it is often in touch with the local populations. As it occasionally nourishes also of carrions, it does not disdain to follow the vultures in their incessant search of carcasses. Its preference is however bound towards live preys it catches swooping on them with fast plungings downwards while flying around as well as during its stakeouts from fixed points. It much loves medium-sized hares and rodents but also terrestrial birds such as guinea fowls and partridges. It has also the innate habit to assail smaller raptors or other birds, stealing them the just hunted prey. It seems that the Bateleur (Terathopius ecaudatus) stands among its choice victims. It often hunts in together with the partner and it is not rare to see them perched on the same tree also in periods outside the nesting. Usually it lives under the 3000 m of altitude that it reaches only on the highlands of Kenya and Ethiopia. It is not a much social bird even if in the Indian subspecies we can observe night gatherings outside from the nidification season. Always in India, in particular in the cities bordering the Thar desert, in some periods of the year they gather in big number, along with other eagles and vultures, around the numerous public slaughterhouses where processing scraps are thrown and abandoned outside and therefore easy prey of necrophagous animals and birds. The tawny eagle has discreet dimensions even if the measurs are well under the admirals of its genus. It is 70 cm long, it weighs up to 2,5 kg and has a wingspan of 180 cm. In any case it is a powerful animal with majestic and vigorous flight and shows fearlessly the typical stateliness of the eagles. Like these ones, it flies skillfully taking avantage from the updrafts with extreme ease and facility and when perched, maintains that noble and strut posture typical of this genus. Its colouration, especially in the young, is very pale and different from that of the congeneric eagles, usually browner and darker in the livery. At times the young are completely white on the chest and very pale in the other parts of the body, so much to render them resembling a completely different genus and species of birds, but with the course of the years and the maturation of the individual the livery gets darker until it becomes wholly brown as the cousins eagles. During this period we can see more or less dark specimens, but always spotted with light patches of ochraceous colour, especially on the upper alar coverts and this characteristic has led the British to call it tawny or the French tanné rightly from tanned. When adult, it is not easy to identify them in particular when perched, considering also the almost similar size of some congeners. 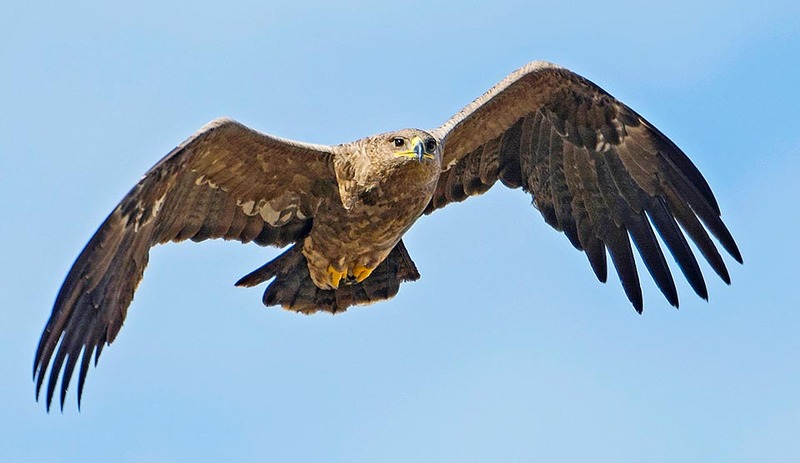 We have the Steppe eagle (Aquila nipalensis), the Greater spotted eagle (Aquila clanga) and the Lesser spotted eagle (Aquila pomarina) that, when adult, are similar and confusable. During the migration season with the overlapping in the territory of all these species, the difficulties in the classification on the field become evident and only through a careful analysis of some details detectable only by close, we can be able to classify the species with certainty. The tawny eagle has tarsi completely covered by feathers with trousers appearing rather swollen and ample, characteristic shared with the steppe eagle but well different from the two spotted eagles whose trousers are tighter and less ample. On the beak the tawny eagle has oblong nostrils, characteristic shared with the steppe eagle but totally different from those of the two spotted eagles where they are perfectly round. 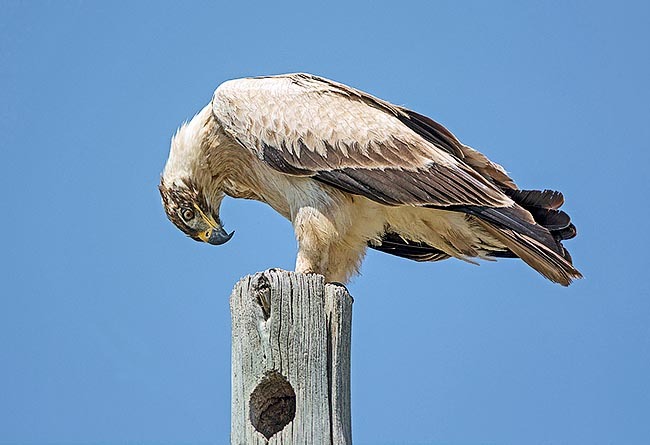 The tawny eagle has yellow buccal fringe that passing under the eye socket gets to about half of the eye whilst in the steppe one the line is markedly longer and ends well beyond. This particular is however shared with both spotted eagles. Conversely, when flying each one of these eagles has well specific characteristics distinguihing them easily one from the other. The tawny has usually an underwing with clear coverts and darker remiges, well different from the two spotted and although resembling the nipalensis it does not show the whitish wide belt characteristic of the young of the latter species. Therefore, it is often a dilemma to do at first glance a neat distinction of these species. It is thought that this eagle is usually monogamous and that rarely changes partner during the reproductive life. It is an eagle that, in the wild, may live up to 15 years and reaches the maturity by the sixth year. It nidifies on big isolated trees usually thorny and inaccessible, placing the nest on the highest branches and often leaning on the upper crown. At times, it uses also high voltage poles. It usually utilizes the same nest for several years refurbishing it from time to time carrying new material up to form significant masses. It nidifies in different seasons depending on the occupied area and on the seasons alternation. Usually it begins spawning during the dry period of the year getting at the eggs hatching by the approaching of the humid season when the availability of food is greater. The nest is an ample platform formed by robust twigs and covered by softer material carried continuously also during the brooding. It lays two very white eggs that are hatched for about 6 weeks and the chicks keep in the nest for 10 weeks more. As normally is the case among the eagles, often occur cases of cainism with the killing of the last born by the first-born, except in the periods of great availability of food where the two nestlings succeed in surviving both. Though accidental victim of poisoned baits by sure not addressed to this raptor, this eagle is not considered as endangered and the populations enjoys an excellent status.